The Ecological Land Co-operative (ELC) was set up to address the lack of affordable sites for ecological land-based livelihoods. A life on the land is a dream for many, but one in which the barriers are high, and the ELC recognised that this needed to be addressed. The ELC develops affordable, residential smallholdings to new entrants to ecological agriculture. Their approach aims to overcome two key barriers: high land prices and planning permission. The ELC is a membership organisation: on joining, members become part of the group of people who collectively own the Co-operative and decide how it should be run. Investor Members have invested money in the Co-operative, share 25% of voting rights and receive returns on their investment. Worker Members are those people that work for the Co-operative. Like Investor Members, they also share 25% of voting rights. Worker Members are employees and volunteers that work at least 15 days each year. Steward Members are ecological land managers and share the remaining 50% of voting rights. Voting rights were awarded primarily to Steward Members as they are the principal beneficiaries but often do not have the time to both run their smallholding and serve on the Board of Directors. 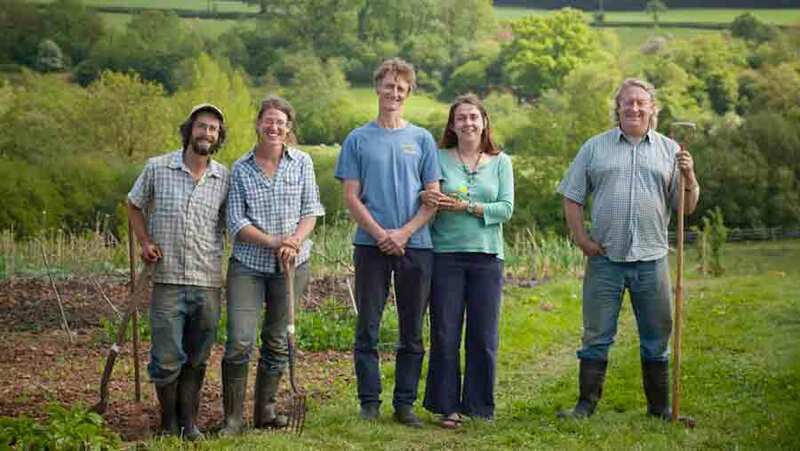 This category of membership was designed principally for the Co-operative’s smallholders but can be applied for by qualified ecological land users who do not farm one of our smallholdings. We hear from some of the ELC’s members on what they think of the multi-stakeholder model. On the basis that the more sustainable something is the better, evaluating the multi-stakeholder co-ops against Permaculture principles gives some idea of its benefits over other models. Good ones to start with are 'Integrate rather than segregate' and 'Use and Value Diversity' as they are obvious features of the multi-stakeholder model. 'Apply Self-regulation and Accept Feedback' comes out of these as there is a built-in value to co-operation where stakeholders can negotiate between themselves for mutual benefit. Stakeholder's different perspectives also helps the group apply with the principle of 'Observe and Interact' with a broader perspective of internal and external patterns of activity and tending towards 'Design from Patterns to Details' around co-operative activities. In terms of social networks 'Use Edges and Value the Marginal' is improved by the diversity of stakeholder group's edges and connections to other networks and especially within social activist settings with those in the margins and edges of mainstream culture. At a practical level 'Use Small and Slow Solutions' may emerge as a natural approach to problem solving in a large long-term group. Where 3/6 R thinking about waste is applied, again the diversity and extended edge of the multi-stakeholder group helps towards 'Produce no waste' and similarly ‘Catch and Store Energy', in the sense that energy and resources can be circulate around stakeholders before leaving the co-op. That leaves 'Obtain a Yield', 'Use and Value Renewable Resources and Services' and 'Creatively Use and Respond to Change'. We have been lucky enough to be able to afford to buy our own smallholding which we have owned and run for 15 years. We wanted to support other people, particularly young people, to do the same. This is partly for selfish reasons – we would like more smallholding neighbours - and partly because we think that smallholdings are environmentally, socially and economically beneficial. We know and have met many would-be smallholders who cannot afford to buy a residential smallholding. The affordability gap is particularly large in our area (southeast England) and the default solution has been to purchase land, set up and apply for planning permission retrospectively – a stressful, risky, and very lengthy process. The ELC’s model provides a great solution to this problem by getting planning permission first, in exchange for environmental and financial commitments. It also brings to the table the apparently growing number of people like us who want to invest in such projects. The other part of the equation is the fact that the people who run ELC are committed and trustworthy and a great deal of thought and effort has gone into making the procedures and policies fair and transparent for both investors and smallholders. The model works - as proven by Greenham Reach - and we are looking forward to similar success in Arlington and other projects. I'm really proud to be an investor member of the ELC. I know that I'm helping to make land available to small-scale ecological farmers and growers in a really new and radical way. But I'm also aware that investor members like me are only part of the picture. None of this would be happening at all without the vision and hard work of the staff team at ELC, or, indeed, the courage and determination of the tenant farmers themselves. So it seems appropriate, and in fact, absolutely essential, that all these different perspectives and interests are fully represented through the organisation. I couldn't profess to fully understand the complexities of voting shares and rights of the different stakeholders, but it feels reassuring to know that decisions are informed by the knowledge, insights and concerns of individuals with different experiences and differing relationships to the co-operative. It's good to know that this vital project can't be taken over by any one particular interest, isn't about being a generous benefactor or a distant shareholder. Rather, we are working collaboratively to create a new version of land ownership and sustainable agriculture which serves us all. My interest in multi-stakeholder co-operatives began with the realisation that the people who could invest in a co-operative enterprise might not be the same people it was set up to benefit - in fact, if the co-op wanted to empower the poorest in our society they would almost always be different people. Shares are a popular vehicle for investment for a good reason; they are 'full risk', with shareholders protecting their investment by being able to vote down rules changes that would defeat the original intent behind the investment. But shares are also the right mechanism to empower the users and beneficiaries of co-ops: the answer had to involve distinctly different types of shares that gave investors a veto on major changes, but left to day-to-day control firmly in the hands of the 'user members'. That led to us writing the 'Somerset Rules' which were adopted first by GO-OP and the Ecological Land Co-op, but later by over thirty co-ops providing housing, food, IT solutions, and energy. They are developing in diverse ways, but some interesting things are becoming clear: there is little conflict between stakeholder groups, as the clear boundaries and allocations send a clear message about what they can reasonably expect. There is strong support from social investors, who are reassured that people whose interests are well aligned with the business have effective control of it. And empowering roles are often created for potential co-operators who have not even heard of the co-op, ready for them to inhabit when the time is right. Written by Lauren and Phil.